Graded 82 EX/MT+ 6.5 by SGC. Hall of Famer, in his Topps Rookie Card appearance. Among nearly 500 copies recorded in SGC's census reporting, less than nine percent have achieved an equivalent or higher tier. 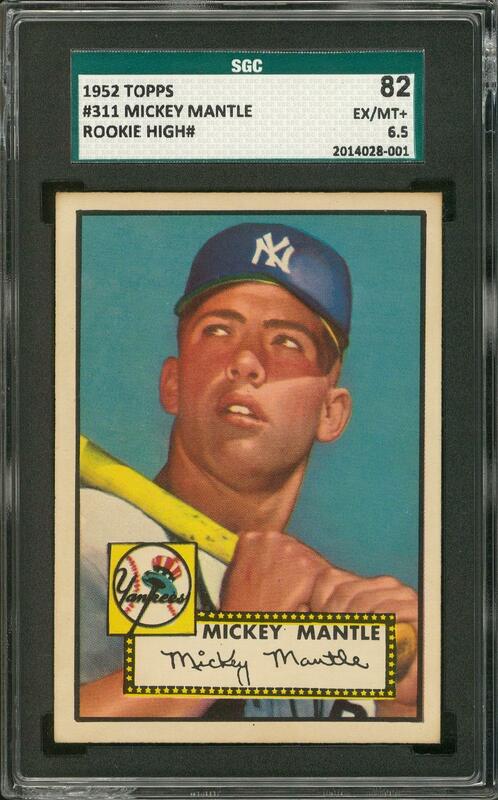 There will never be enough visually pleasing 1952 Topps Mantles in the hobby to fulfill collector demand for what is arguably the most desirable baseball card ever made. These special pieces have generally found solid, effectively permanent homes, where bragging rights are more important than dollars. Few individuals are ever willing to part with an item that defines an enthusiast's status in the hobby. 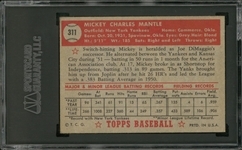 The 1952 Topps Mickey Mantle has always been a key card in any collection. 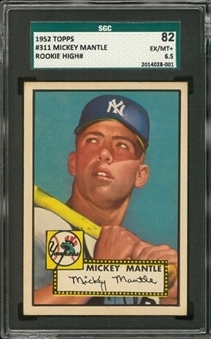 Even during the mid-1960s, at the very beginning of the organized hobby, the '52 Mantle card carried a premium when star cards from other prominent sets (like Cobb and Ruth!) cost the same as a common. Actually, the word "common" wasn't even used at that time – the concept giving rise to the word did not yet exist. Cards from a specific set were all "common" or they were all "rare." The "High Number" series in 1952 Topps was solidly in the latter category, even then, and a serious proposition when pondering additions to a collection. Many collectors stopped at number 310 and moved on to the next project. As the hobby grew, and time passed, more and more cards emerged from attics and basements. Vintage cards, even '52 Topps high numbers, have become more readily available, and any collector with deep pockets can complete the set. Now, the challenge is condition. 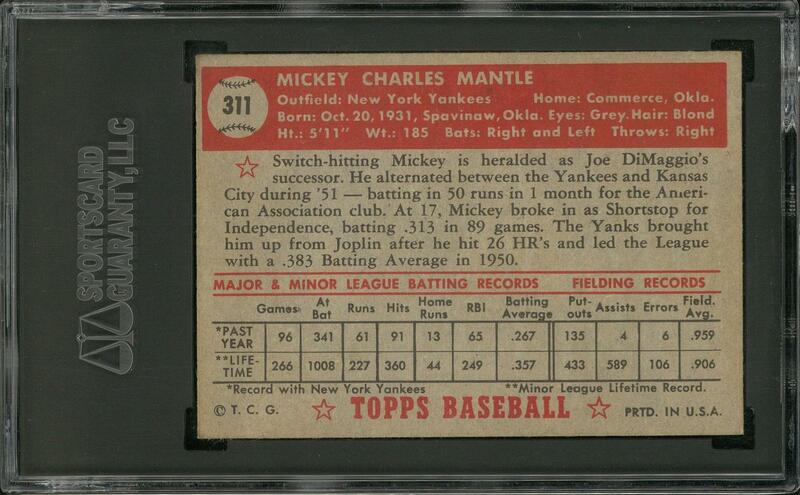 Building a set of 1952 Topps in a quality state of preservation is a mission for a lifetime. The location of a suitable Mantle is the pivotal issue in such a quest, and a thoroughly satisfying example is presented here. The offered card will immediately assume its place as the cornerstone of the winning bidder's collection. (After this, all future acquisitions will be likely to pale in comparison!) This special card delivers an appearance to match its mystique. Clean surfaces, rich portrait colors and a smooth, azure background distinguish its presentation. Here, the viewer can see one of the most impressive and valuable individual pieces in our entire hobby. This is an undeniably superior example, with captivating aesthetic properties. Excellent to Mint-plus condition.